You posted signs all over her. You watched your baby like a hawk. Still, somehow, someone managed to commit the unforgivable. There’s no seeing past it. It makes the 3-year-old inside you want to howl just like you did when Uncle Clyde backed his truck over your Radio Flyer. Believe it or not, this time, you may be able to fix it. After all, even though it seems like the travesty to end all things original, factory and stock, it’s just a scratch, right? First, know that you are not alone. In the United States alone, antique car enthusiasts number in the tens of thousands at shows. As boomers search for hobbies to gild their retirement years, the number only increases. Just think of all those cars and their scratches just waiting for a healing touch. All those folks are going to be Googling “how to buff out scratches on a car.” Buffing scratches on a car by hand isn’t difficult. It just takes time, patience, a light hand, a few supplies and an understanding of paint repair. 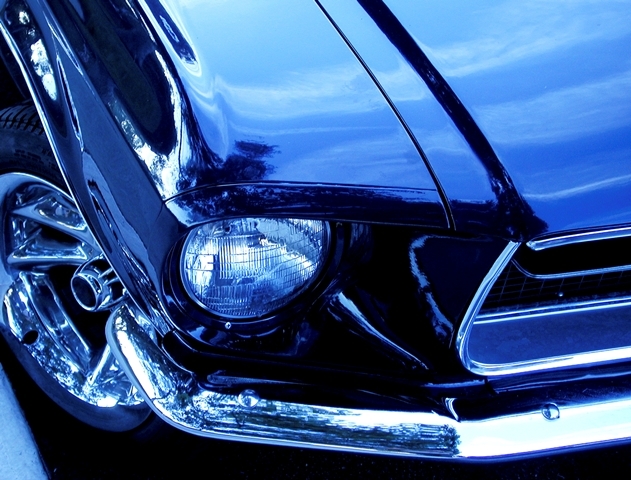 When you’re talking older cars, the paint probably won’t be one of the modern acrylic urethanes. Most likely, especially if your car is from the 1920s through the 1940s, it’s an acrylic lacquer or enamel. You need to know which because lacquer and enamel don’t play nicely together during paint repair. If you have the luxury of a label under the hood or on the door sill, you have the treasure trove of information you need, including color codes. Some websites specialize in matching paints by year, make, model and even vehicle identification number for even the oldest cars. Others offer custom-mixed colors; bring them a gas cap, and they can solve your riddle. If, however, you find yourself at a loss, you can determine between lacquer and enamel by picking a tiny spot and applying just a smidgen of lacquer thinner. If paint wrinkles or lifts easily, you have enamel. If only hard rubbing lifts color, you have lacquer and most likely all-in-one clear coat and pigment. If your cloth remains clean, surprise! You have urethane paint. Your car may have been repainted. Why is this important? 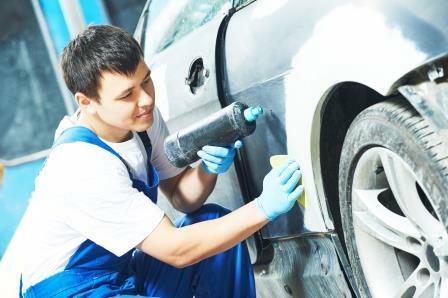 If the scratch penetrated beyond the clear coat — as so many do — you will need a matching paint for a flawless paint repair. Put lacquer on enamel, and you’ll have waves. You also need to determine if your car has a clear coat. Enamel may or may not, depending on whether it’s single- or two-stage paint. Sand a small, unobtrusive spot on your car by hand. If the dust is white, you have clear coat; if it’s colored, you don’t. Worst-Case Scenario — Full Paint Repair? Can you see metal or primer? If you only see thin white scratches, most likely you’ll only be buffing scratches from the clear coat and can skip ahead. If, however, the scratch is deep, invaded primer or exposed metal, you either have to fix this right or accept the body cancers of rust and chipping paint. A Band-Aid is not going to serve. Think of this as stitches. Hurry or skip a step, and you’ll leave a scar. – Moderate temperatures, ideally between 65 and 80 degrees to ensure paint dries, adheres and glosses properly. – Protection from sun, moisture, wind, and pollen or other airborne particles. – Relative humidity less than 60% to prevent condensation while the solvents that contain the pigment evaporate. – Fine sandpaper from 2000- to 3000-grit. – Sanding block or sponge to back sandpaper for even sanding and a good grip. – Spray bottle of water for wet sanding. Some people add a drop of mild dish soap to reduce friction. – Rubbing and polishing compounds. Note that some of the new compounds purposely taper and lose their abrasiveness through rubbing to prevent errors in judgment. – Lots of clean, soft terry cloth or microfiber towels or pads. – Clear coat, if needed. Steps To Perfection Take Time — Be Careful, Go Slowly, Clean Constantly and Check Often! Clean the Wound. One of the greatest sins in paint repair is to dive in without first using a cleaner to remove all waxes, oils or just plain dirt from the surface. Just as you wouldn’t cover a scratch on your skin without washing it first, you cannot skip this one. Paint over residue, and the only thing that will stick will be rust. Apply Primer. Primer is the bond that holds paint to metal. Without primer, your paint won’t adhere, no matter how tiny the scratch. If it flakes, each chip will take just a little bit more of your original paint, and the scratch may grow. Too, the primer is the shield against moisture. Skipping primer is an open invitation for rust. To apply the primer properly, carefully paint a thin layer where metal shows. If you get primer on good paint, wipe it off immediately. Once the area is primed, you need to let it cure, or harden, for 24 hours. Sand Primer. Primer is porous. You may have ripples that don’t show now but might later. You may also have some primer overrun. To be sure you will have the best result, very carefully wet sand the primer and scratch edges by hand with 2000-grit sandpaper. You don’t want to dig down into surrounding paint, just make sure the primer is smooth and only where it should be. Clean. Every time you sand, you need to carefully wipe away all the abrasive debris and residues. Always use a clean cloth, and never skip this step. Otherwise, you may be buffing your entire car by hand! Use Rubbing Compound and Clean. If you have a deep scratch requiring primer, you may want to use a little rubbing compound to slide a little glossy paint back into the area. This can ease the transition area a bit and help to keep your footprint small. Remember that rubbing and polishing compounds are abrasive, so always wipe it away before beginning the next step. PSC3R — Paint, Sand, Clean, Compound, Clean, Repeat. You’re going to apply your matching paint one thin layer at a time until you fill the scratch and the surface is smooth and level. Sounds easy, right? It is — to a degree. It’s a rhythm: You paint, you buff and you clean; you compound, you buff and you clean. Each time, you need to let the paint cure overnight before you buff with fine 2000-grit sandpaper and water, progressing to 3000-grit. Once the surface is smooth and clean, you buff with a soft cloth and a dab of rubbing compound to blend the old paint with the new. Then, you clean again and repeat the process until you have a smooth, high gloss. When you buff, never, ever move in circles or arcs unless you like paint swirls or lots of haze. The key is back and forth, back and forth, never trying to accomplish too much at one time while buffing the scratches. Be too ambitious, and you’ll scuff surrounding paint too deeply. Once you’ve made it this far and completed the basic paint repair on your car by hand, depending on how it looks and your clear coat requirements, you can move on to the following sections. 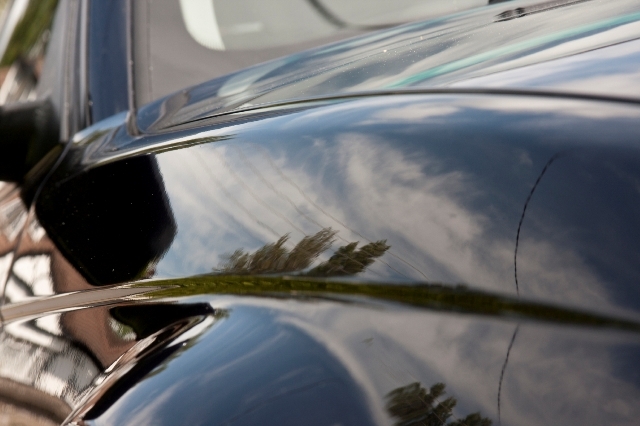 If you’re lucky, you’ll just be buffing scratches that penetrated only the clear coat or the very top layer of paint. Sometimes, even for seemingly deep scratches, if you’re patient and willing to take the time, you can buff the paint and restore your car by hand. The process is much the same, only with no fillers. Once you’ve washed the surface, you should be able to use a SC3R approach — sand, clean, compound, clean and repeat. Using fine sandpaper — at least 2000-grit, preferably 3000 — on your backing, lightly wet sand back and forth. The first sanding is a test. Go lightly so that you don’t overdo it. You can always sand more, but you can never un-sand what you’ve removed. Remember that while the surface is wet, the scratch won’t be as obvious. You’ll have to let the area dry before you can really tell how much progress you’ve made. You may need to sand again before using a rubbing compound if the scratch is still obvious. Buffing gently with fine 3000-grit sandpaper warms the paint and even helps to move it if you maintain a steady, even pressure and motion. Just keep sanding, cleaning and checking a little at a time. Always let it dry in between sandings. You may think that scratch is gone, but it probably will keep resurfacing, hopefully fading a little each time. Once you’ve let the area dry and are sure you’ve buffed out the scratch, you’ll want to apply some polishing compound on a soft cloth or microfiber pad. Once you’ve thoroughly buffed the paint and cleaned it, you should see a smooth, shiny-clean factory-quality gloss. However, you’re not done yet. As you buffed and polished and cleaned, you also removed your protective wax from the area. If you have acrylic lacquer paint, you can go ahead and apply a liquid wax sealant, buff the paint out one last time and call it a day. If, however, you need a clear coat, you have one more step to go before you can stand back and admire the mirror finish. The goal is to use just enough without overdoing. Some experts recommend cutting a dime-sized hole in a piece of paper and spraying through it. If the paper starts to sag, you’re using too much. If the paper gets stiff and glossy, you’re not applying enough. You let the clear coat dry for 24 hours; then, you can buff the paint with some 3000-grit fine sandpaper, clean it, apply some polishing compound and clean again. Apply a second clear coat, wait another 24 hours and repeat. Finally, you should be able to apply a thin layer of liquid wax sealant. Some of the new ones are polymer coatings offering ultraviolet protection, chemical bonding to paint and quick curing that hardens to a glossy protective finish. Many come in fine spray mists, and a squirt or two plus some buffing with a microfiber cloth or pad give a finishing touch that’s hard to beat. Once you know how to buff out scratches on a car by hand, you’ll never have to allow a car detailer to hold your wallet hostage again. You don’t need expensive power sanders or buffers. You don’t need $50 in pads. You won’t have to shudder when you see swirls, ripples, waves, and hazing appear rapid-fire to transform a little scratch into a devaluing abomination. You can take care of your baby all by yourself, step by step, scratch by scratch, buff by buff. I have a key scratch that has turned to rust, of course I can’t pay outrageous amounts of money to repair. I think I am on my own. There is no flecking yet. Bet way to start and best products. Car is black and there are other key scratches but not to the metal. Woo is me. Scare as heck to try to repair it on my own, but have no other choice. HELP IS DESPERATELY NEEDED. Hi Lydia, The best product we can recommend is using our 3-step compound, polish and finishing polish. While these products may not fully eliminate deep key scratches, they can help in reducing them (even eliminates light scratches) and protect the car’s surface from rust and further environmental damage. Please contact us at marketing@goldeagle.com if you have any questions.